Happy #SaturdayShopping. Hope you are enjoying the warmer weather… I’ve been enjoying a lovely lunch with friends… in the garden! Today’s #SaturdayShopping (by request) features 5 stylish jackets for day or evening wear this spring/summer. 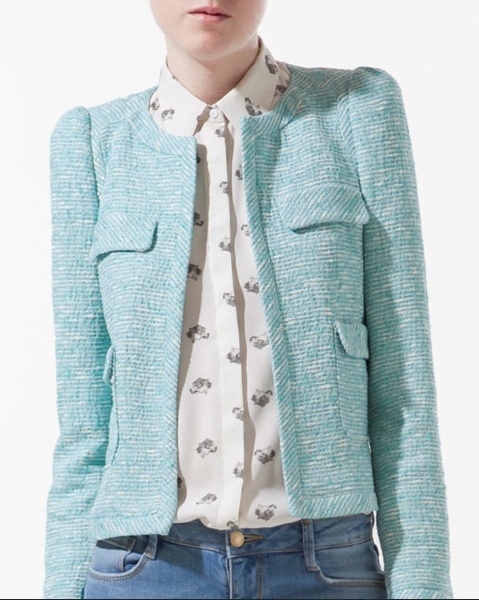 Fantasy Fabric Blazer by @UkZara – Lovely mint green blazer works day or night with jeans or with skirt @ £79.99. Freja Denim Jacket by @thisiswhistles – Classic blue wash denim jacket in slim fit @ £95. Hayden Jacket by @FC_Woman – A smart utility look with skinny jeans for day or casual evening in the pub @ £130. Feppa Double Breasted Jacket by @ted_baker – Stylish spring/summer jacket in beige for work or play @ £179. Lauren Quilted Leather Jacket in Dove Grey by @REISS – For the biker chick in all of us @ £375. 5 gorgeous jackets for every style and occasion but which is the ultimate coat of arms in today’s #GTopSpot?